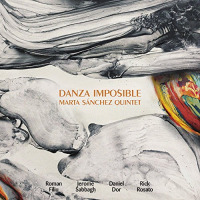 Dovetailing lines, capering rhythms, and colorful harmonies rise to the surface and coalesce on pianist Marta Sánchez's Danza Imposible. Just don't expect them to arrive in predictable fashion. Instead of taking the obvious pathways through or directly to an idea, Sánchez paves byways and discovers wormholes that prove far more interesting and meaningful as travel routes. Some of her writing is built around the idea of problem-solving, concept-making or code-breaking, and all of her music has strong conceptual footing, but the end results sound wholly organic rather than academic or contrived. 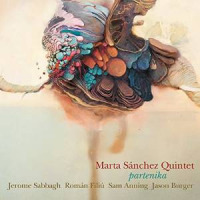 In returning to the quintet format that she utilized on Partenika (Fresh Sound New Talent, 2015), Sánchez is able to further her divergent explorations in bonding voices, blurring lines, and breaking free of norms. Braided saxophones move over a glistening backdrop on "Copa De Luz," a vehicle designed as an exploration in nine and a work taking inspirational cues from sources as different as bassist Eric Revis's In Memory Of Things Yet Seen (Clean Feed Records, 2014) and Tune-Yards' "Look Around"; "Danza Imposible" brings Aphex Twin's dizzying digital delay ideals into an acoustic realm, using staggered saxophone entrances to create a blurred reaction before opening up space on the canvas for solos; a peculiar beauty beckons on "Scillar," a texture piece originally penned for a band without bottom-end bolstering; and the chic "El Girasol" gives off gracefully streaming movements and broken thoughts in seven. This is music that's completely in keeping with Sánchez's previous work, yet these songs tend to probe a bit deeper and project darker and more complex shadows. The album's second half finds Sánchez further cementing her position as a multiform artist and ceaselessly creative pianist. "Board" projects a hip attitude propelled by a strong sound current and deep-seated groove, "Nebulosa" paints a foggy narrative that's lost and found in the clouds and stars, "Flesh" presents in a menacing 6/8 with emotionally countering piano and bass statements, and "Junk Food" shines a light on how separate thoughts conjoin. Judging from this music and the album that preceded it, choosing the right partners for projects seems to be one of Sánchez's strong suits. Saxophonists Roman Filiu and Jerome Sabbagh, both holdovers from Partenika, bring a fresh sound to the fore in their individualistic statements and blend, and bassist Rick Rosato and drummer Daniel Dor work with the requisite sensitivity and focus needed to bring these different ideas to fruition. But Sánchez herself proves to be the most enthralling presence in the mix. Possessing firm ideas and a flexible mindset, she makes everything shine anew. Track Listing: Copa de Luz; Danza Imposible; Scillar; El Girasol; Board; Nebulosa; Flesh; Junk Food. Personnel: Roman Filiu: alto saxophone; Jerome Sabbagh: tenor saxophone; Marta Sánchez: piano; Rick Rosato: bass; Daniel Dor: drums.